This may seem to be a process that is so simple that it needs no explanation, but if you have never done it, even simple things can appear to be complicated. The first thing you need to do is decide on the speaker system that you want. This largely depends on what you want to listen to. If you listen to a lot of music on your computer and want it to sound like it does when it’s played live in the club then you may want to consider a surround sound system. This is great if you live alone or have a sound proof computer room. It may be a little too much of a good thing though if you share your house with others. You can find some nice speakers that will produce good sound with only two speaker systems though. This is the most common set up for computer speakers so you may find that this option allows you a wider variety of brands to choose from. Some sets come with just the speakers and some also include a sub woofer that acts as the main power supply for the speakers. If you are still producing more sound than other people in the house appreciate you could always decide to go with a headphone set. This option allows you to listen to your music at the level you enjoy, but others in the house do not have to listen with you. Many people who play online games use a combination of head phones and microphone together to allow them to talk to the other people that are gaming with them. Once you have made the decision on the best speaker system to fit your needs, it is very easy to install them. If you went with a two speaker set, which is the one most people use with their computers, then you will have a right and left speaker and possibly a sub woofer. One speaker will usually have the volume control knob on it. On mine this is on the right hand speaker, which is handy because I am right handed. 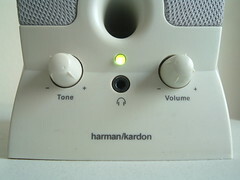 You may be able to find a set with the controls on the left speaker if you are left handed. On the back of the speaker will be a cord coming out and on one there will also be a jack or a spot to plug a cord in. Some sets allow the speakers to be interconnected and some just have both hook up directly to the sub woofer. Plug the cord from the sub woofer into the outgoing jack on the back of your tower. This jack will be down by the area where your sound card is installed. Then plug in the power cord which is usually attached to the sub woofer. Turn on the computer. You may need to load a driver disc if one came with your speaker system, if not then you should be all set.